The Lower Manorburn dam is one of the most popular places for ice skating in New Zealand. People have been skating on the Manorburn dam since it’s construction in the early 1900’s. During the 1950’s and 1960’s dozens of buses would travel from Invercargill and Dunedin filled with skaters. Since 1992 the number of skaters making use of the dam has plummeted due to the local ice sports organisation no longer officially opening the dam for skating. However, the ice does freeze most years and serious natural ice skaters frequent the dam regularly during the winter months. 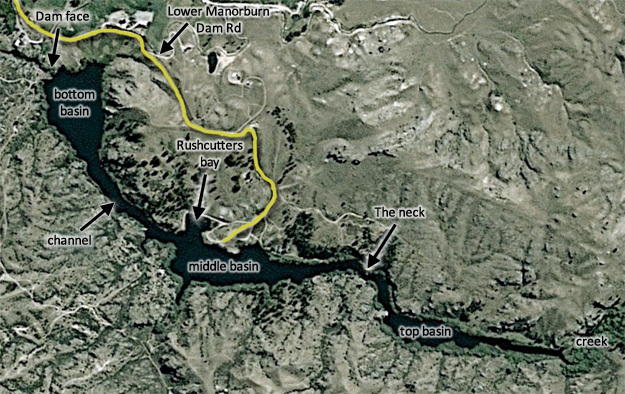 The Lower Manorburn dam consists of three main basins connected via channels. Visit the following information for specific information about the various parts of the dam. The Lower Manorburn dam is one of the most commonly frozen pieces of ice in New Zealand. The dam is made up of three basins, the top, middle and lower basins. Each basin is connected by a channel. The top basin usually has the safest ice, followed by the middle basin and then the lower basin. The two channels can be hazardous though and even if two basins may be safe on their own, the interconnecting channels often have insufficient ice for safe skating. Access to the Lower Manorburn dam is easy. Head north-east out of Alexandra along the Manuherikia road and before heading uphill turn right onto Galloway Rd. Take the next right, then follow gravel/dirt road. You will reach the bottom basin where the dam face is initially, but most skaters continue to the middle basin where there is better parking and seating facilities and where the ice is usually safer. If you have any information, photos or stories relating to the Lower Manoburn dam which you think would be suitable for this page, please send it to us, or apply to be an official contributor to the site.